Though teething can be a painful and difficult process for babies and their their parents, knowing what to expect to handle it can make things go much more smoothly. Your baby could start teething anywhere between 3 and 12 months of age, and in some unusual cases, even later. By and large, though, the teething process will begin around the 6-month mark. Teething normally takes place over a year or more. Most babies will have all their primary teeth when they are between 2 and a half to 3 years old. How many baby teeth will erupt in all? Children develop 20 baby (primary) teeth. Which primary teeth erupt first? Drooling - When teething, babies drool excessively; so fasten a bib on to keep your baby dry, you’re in for a soggy time! Teething Rash - As a result of the excessive drool, redness, chapping or chafing around the mouth and chin can occur. To minimize this, regularly pat the drool away with a clean dry cloth, or try creating a moisture barrier with a product like Vaseline. Coughing and/or gag reflex - The excess drooling can also sometimes make your baby gag or cough. Biting - As they push through the gums they cause a great deal of pressure, which can feel very uncomfortable. This pressure can be relieved somewhat by counter pressure – that is, biting. Lest your fingers be on the receiving end of the of these surprisingly painful bites, make lots of teething rings available! Irritability & Crying - Continuous discomfort can understandably make babies feel a bit grumpy. While some babies are only irritable for a few hours at a time here and there, others are crabby for days or even weeks on end. This can also mean more frequent bouts of crying. Sleep & Feeding Disruption - The discomfort of teething may also disrupt your baby's daily eating and sleeping patterns; and yours, too! Teething babies will often resist feeding, and may wake up more frequently at night. Cheek Rubbing and Ear Pulling - Shared nerve pathways exist between the cheeks, gums and ears. Sore, achy gums can therefore cause discomfort in the ears and cheeks also. Your baby may respond to this discomfort by pulling on her ears rubbing at her cheeks. 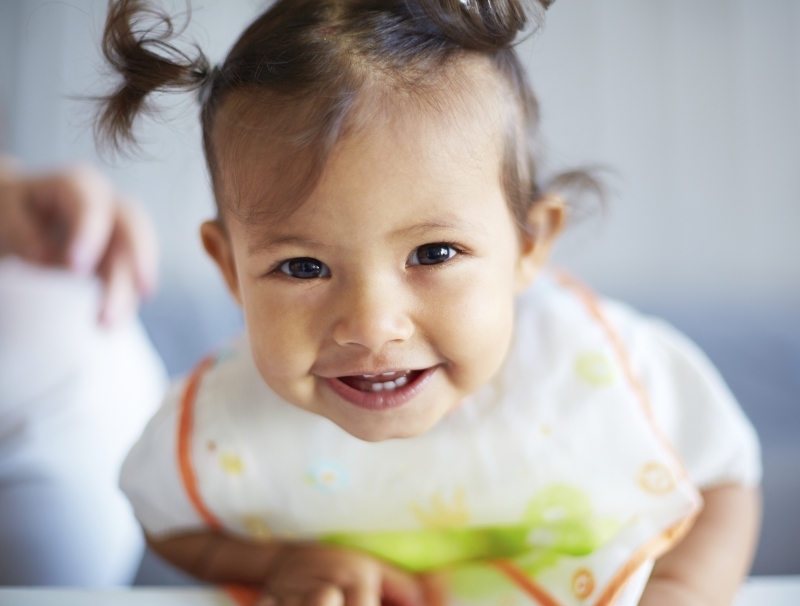 How can I make the teething process easier for my baby? As mentioned, teething rings, rattles, and other chewable toys should be available for your child to bite for counter pressure. Cold things can be particularly soothing. Try a cold wet washcloth kept in the fridge, and chilled food and drinks. In severe cases, pain medication may be helpful, but this issue should be discussed with your pediatrician first. Finally, provide lots of extra comfort in the form of snuggles, extra kisses, and as much patience as you can muster. This will help you and your baby to get through the teething process more happily. If you have questions about your baby’s teething needs, contact the Smile Town Burnaby team today, and let us help.